After filming for my project this weekend, I came home to watch the video and realized that I was moving too quickly so today I thought I would do something useful for me and learn how to change the time of a video by using slow motion, fast motion and reverse motion. 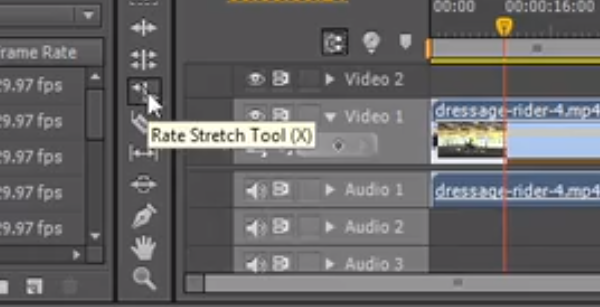 First Option: To change the speed, one way you can do that is to use the Rate Stretch Tool (shortcut “x” for both Mac/PC) and you can grab the clip from either end and either lengthen or shorten the clip which will either slow it down or quicken it up. The only danger in doing this is that it can mess up the audio and make everything either high or low pitched accordingly, so beware! If you don’t plan on using the audio, it shouldn’t be an issue. Second Option: Use the “Clip Speed/Duration” option by right clicking and clicking “Speed/Duration”. A clip menu should come up and you can change the speed percentage and duration accordingly for your video. There is also a great option in CS6 to Maintain Audio Pitch so you there won’t be any dramatic cartoon-like changes. In this menu, you can also reverse speed to play the clip backwards, but again, beware of the audio. ~ by kimhaley on November 9, 2013. I think since you are teaching fast motion, slow motion, and reverse speed, it would be better to have three separate sections, instead of including reverse in the second section. I would suggest re-reading this post to check for clarity in language. Some parts use repetitive wording and long sentences that are difficult to read and understand. I thought your blog post was really helpful, and if I had to find something to critique, I would say that it might have been helpful to include a tiny detail like increasing the percentage to over a 100% would speed up the video, whereas reducing the percentage to below a 100% slows it down.